In Article 5 of the Convention, DNAs are obliged to submit to the Secretariat, a notification on a final regulatory action that has been taken nationally to ban or severely restrict a chemical in their countries. A notification form is available for completion by a DNA with guidance to complete the form. Annex I of the Rotterdam Convention contains information requirements for notifications that are prepared as requested in Article 5 of the convention. DNAs are expected to provide all the information contained in Annex I for each chemical that has been considered in making the final regulatory action. For the Chemical Review Committee (CRC) to review the notifications on a chemical, there must be two notifications for that chemical from DNAs from two different PIC regions, where both notifications satisfy the Annex I requirements. Therefore, if only one notification is received from a single PIC region that satisfies the Annex I information requirements, that notification is retained at the Secretariat till a second notification from another PIC region that also satisfies Annex I requirements is received. There are over 200 such single notifications on various chemicals. These notifications and their associated chemicals are available here. DNAs are encouraged to consider these chemicals as a priority for final regulatory action. DNAs are also reminded to contact other DNAs if support is required to decide on a final regulatory action. The Secretariat can also be contacted for information that may assist in completing the notification form. 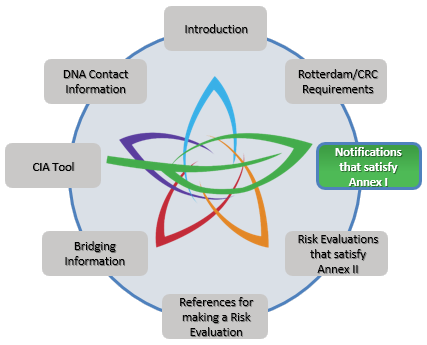 DNAs are also reminded that bridging information from a risk evaluation undertaken by another country, which has similar local conditions, can be used to support a decision to take a final regulatory action. The use of bridging information is further expanded in another section of the toolkit. As resources are limited in developing countries, DNAs from these countries are advised to consider bridging information, especially for risk evaluations that would require extensive human and financial resources to undertake a scientifically sound exercise.